Is the Google Moonshot Dead? Since Google morphed into a new company called Alphabet last year, there’s been an apparent bloodbath for the tech giant’s popular (and costly) “moonshot” projects. These longer-term, riskier ventures are suddenly being held to account for the amount of money they were losing. The result hasn’t been pretty. Alphabet has since systematically killed many of the projects, and we can now add one more to the growing list. 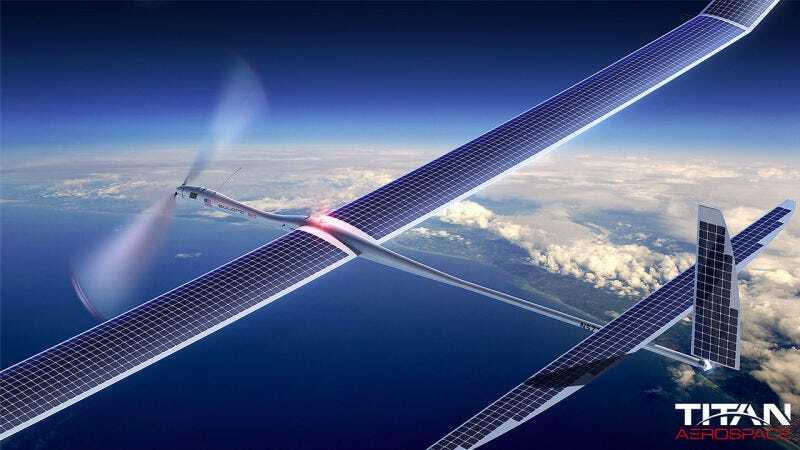 Project Titan, the drone program that Google thought could beam internet down to Earth using solar-powered aircraft, is officially being axed. As first reported by 9to5Google and later confirmed by Gizmodo, the Titan group was recently shut down and more than 50 engineers were told to look for new jobs. The company announced the news in a statement. This shouldn’t have been much of a surprise to anyone following Alphabet’s restructuring. According to the most recent earnings report, Alphabet’s “other bets,” which includes all of the moonshot projects, reported a third quarter operating loss of $865 million. The company does not break out the operating costs of each project, but it’s safe to assume that research and development for a flying internet drone doesn’t come cheap. Alphabet’s internet drone program has rightfully faced scrutiny since April 2014, when Google first acquired the drone startup Titan Aerospace for an undisclosed amount. In May 2015, during one of its earliest test flights, a prototype for the solar-powered drone crashed at a New Mexico test site. A report from the National Transportation Safety Board published a year later declared “the aircraft began an uncontrollable and erratic flight path roughly straight ahead in a rapid descent” because of a wing failure. The drone reportedly had a wingspan of 164 feet, nearly the same as a Boeing 747 with a wingspan of 196 feet, so you can imagine what the crash scene looked like. While the notion of internet-delivery drones is exciting for anyone that loves science and technology, the economic realities of this dreamy idea are hard to ignore. Google’s retreat could have a major impact on other big companies invested in the internet space race—namely Facebook—who built an internet-delivery drone of its own. Facebook’s Aquila drone, which is also supposed to beam Internet down to Earth, crashed in June 2016 during its first test flight. According to a National Transportation Safety Board report, the drone suffered “structural failure” as it prepared for landing. The incident was classified as an “accident” by the NTSB that resulted in “substantial” damage to the aircraft. Turns out building concepts straight out of science-fiction novels is actually pretty tough. The failure of Alphabet’s Project Titan is just the latest reminder that moonshot projects are hard to pull off, even with teams of the best engineers in the world. Alphabet investors have certainly taken notice, which is why some of the company’s moonshots are getting scrapped. In December 2016, The Information reported that Alphabet was “scaling back” its self-driving car—another widely publicized moonshot project that geeks had high hopes for. According to the report, Alphabet “settled on a more practical effort to partner with automakers.” The company launched Waymo in December of last year, with the goal of competing more aggressively with fast-moving self-driving car competitors like Uber, which has a fleet of autonomous vehicles already on the road. Alphabet also killed its modular phone moonshot, Project Ara, last September. Project Ara was one of the first flagship programs from the revered Advanced Technology and Projects (ATAP) group, which Google inherited from Motorola. The goal of the project was to build a phone with interchangeable parts in order to reduce electronic waste and prolong the lifespan of smartphones. The company had even promoted a timeline for opening up sales to the public in 2017 during its 2016 developer conference, Google I/O, before mercilessly killing the project a couple of months later. “It’s disappointing to the teams who have worked so hard to make it real, disheartening to the developers hoping to bring their innovations to life, and frustrating to the fans across the world who were so eager to have Ara in their hands,” said creator of Project Ara Dan Makoski in a 9to5Google report, following the announcement. The quote should give some indication as to how blindsided the engineers are during these type of decisions. Alphabet has also reportedly decided to put Boston Dynamics—the company that built terrifying robots like BigDog and Atlas—up for sale. It bought the company back in 2013. According to a Bloomberg report in March 2016, executives focused on making sure all of the companies under its corporate umbrella were able to generate revenue “concluded that Boston Dynamics isn’t likely to produce a marketable product in the next few years.” In June 2016, Nikkei Asian Review reported that Toyota was in “final talks” to acquire the robotics division from Alphabet. Then there’s Google Fiber, a seemingly obvious product that sells something everyone wants—super fast internet. Alphabet announced in October the company was “pausing” its Fiber operation in ten cities. The announcement used similar language to press releases about discontinuing Project Ara and other moonshot projects. In this case, engineers were at least given a warning shot when Alphabet CEO Larry Page passed strong recommendations to Google Fiber leader Craig Barrat and told him to cut his staff numbers in half. That doesn’t leave many moonshots left. There are still ambitious projects like Alphabet’s smart contact lenses (under development from a company called Verily) or its life extension project (from a company called Calico). Still, Google Fiber, Project Ara, Project Titan, and the company’s self-driving cars are the ambitious projects that have represented the enterprising spirit the company has long embraced—and that tech fans loved. It might just be part of Google’s—er, Alphabet’s—maturation that it won’t publicly bet on moonshot ideas as much anymore. We’ll have to wait and see. It’s too early to declare the moonshot dead entirely. After all, the company is still burning billions of dollars on projects that don’t make any money. Let’s just hope the company keeps dreaming big.